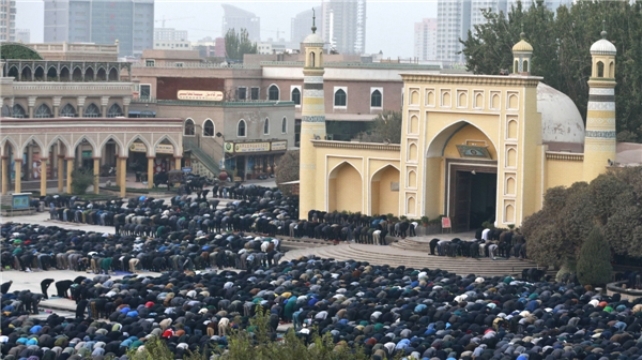 BEIJING: Hundreds of ethnic Hui Muslims are staging a sit-in protest in China’s western region of Ningxia against government plans to demolish a huge new mosque, amid tightening curbs on Islam to pull its practice in line with the Chinese mainstream. The Weizhou grand mosque, with numerous domes and minarets in a Middle Eastern style, had not received proper permits before construction, officials in the town of Weizhou said in a notice on August 3. The mosque would be forcibly demolished on Friday, they added in the notice, widely circulated among Chinese Muslims on social media. “If we sign, we are selling out our religious faith,” a Weizhou mosque supporter said in a note on messaging app WeChat that was seen by Reuters, urging villagers not to sign on to the mosque rebuilding plan. “I can’t talk about this issue,” said Ding Xuexiao, the mosque’s director, when reached by telephone. Mosque imam Ma Liguo said the situation was “currently being coordinated”. Neither of the men would elaborate. There was a protest at the mosque on Friday, a man at a government religious office in the county, the Islamic Association, confirmed, adding that the government only wanted the structure “renovated to reduce its scale”. “The work with the public is ongoing. There has not been a specific consensus reached on the rectification plan,” said the man, who declined to be identified. Reuters could not immediately reach the Weizhou government to seek comment and officials in the surrounding county of Tongxin declined to comment. Senior Chinese officials have urged Muslims to guard against creeping extremism, such as foreign styles copied on mosques, and strive to practice their faith in a more ‘Chinese’ way. Well-integrated in society with decades of smooth ties with the government, many Hui have watched with detachment as authorities have subjected the far western region of Xinjiang and its Uighur Muslims to near-martial law, with armed police checkpoints, reeducation centres, and mass DNA collection. The treatment of Uighurs has spurred an international outcry, with US officials saying tens of thousands of people have been detained in Xinjiang’s detention centres. But Beijing’s policy of ‘Sinification’ of religion has increasingly alarmed many Hui, who fear it is widening its strict measures in Xinjiang to additional Muslim areas, such as Ningxia and neighbouring Gansu province.